Welcome to the Greenest Hotel in San Antonio. 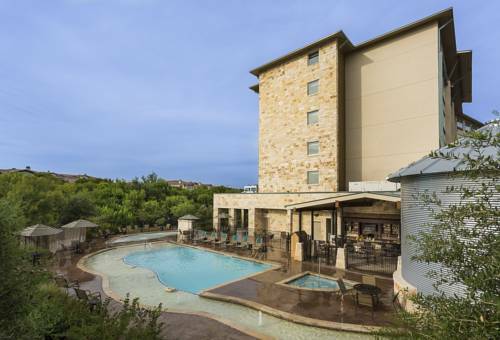 Few hotels in San Antonio can match the amenities Holiday Inn San Antonio NW SeaWorld Hotel offers.Enjoy a hotel with free Wi-Fi, spacious, eco-friendly accommodations and a state-of-the-art fitness center. Enjoy the convenience of a San Antonio hotel with free shuttle to SeaWorld (based on availability). Refresh by one of our three pools, indoor lap pool open year round, seasonal outdoor pool, and a children's pool. Grill is open daily, along with room service. Complimentary laundry and free self-parking is available. Our official SeaWorld San Antonio hotel offers a great experience and a great location. Along with being near SeaWorld, our hill country resort-style hotel offers a convenient and affordable location for guests to take in other attractions nearby. Visit Six Flags Fiesta Texas, or the downtown RiverWalk. Take in a Missions baseball game at Wolff Stadium. Travel to the top of the Tower of the Americas for magnificent views. This modern hotel near Lackland AFB is ideal for work or play. Stay connected when on the road. Business amenities include free Internet, 24-hour business center and over 5,000 sq ft of meeting space. The Grill offers you all American Favorites along with daily happy hour prices on beverages and appetizers. The Cambrian Ballroom is ideal for your next wedding or meeting. Located lobby level for your convienience, the large windows overlook the terrace area. Divisible into three equal sections. Nice meeting room for small groups with large windows overlooking patio area. Upscale board room with large conference, table, 10 executive chairs and side tables and additonal seating area for straight back chairs. Upscale board room with large conference table, 8 executive chairs and decorative side tables. Video screen, teleconferenceing. The Shops at La Cantera are the best the city of San Antonio offers including Neiman Marcus, Nordstroms, Macys, Dillards, and wonderful restaurants too. About 20 minutes from the hotel. Experience one of San Antonio's finest courses. Just a short drive from the hotel - free transporation to course. Six Flags / Fiesta Texas Theme Park 17000 IH 10 West San Antonio, TX 78257 (210) 697-5050 Check their web site for days and hours of operations www.sixflags.com Enjoy the new rollacoaster at Six Flags along with their other rides and attractions. San Antonio's number one attraction - the famous Paseo del Rio. Enjoy restaurant and shopping along our unique attraction. Paseo del Rio Association - (210) 227-4262. River boat rides available. Located adjacent to the downtown area. Many sports activites and concerts take place in the Alamodome including Dallas Cowboys and other sporting activities. Located in downtown San Antonio. Great for younger children. Sample some of their unique play and learn displays. Come see where Texas' history begins. Open seven days a week except Christmas and New Year's Day. Home of the air force finest cadets. Each week new cadets graduate for the US Air Force. Call and ask for BMT or SATO rates.